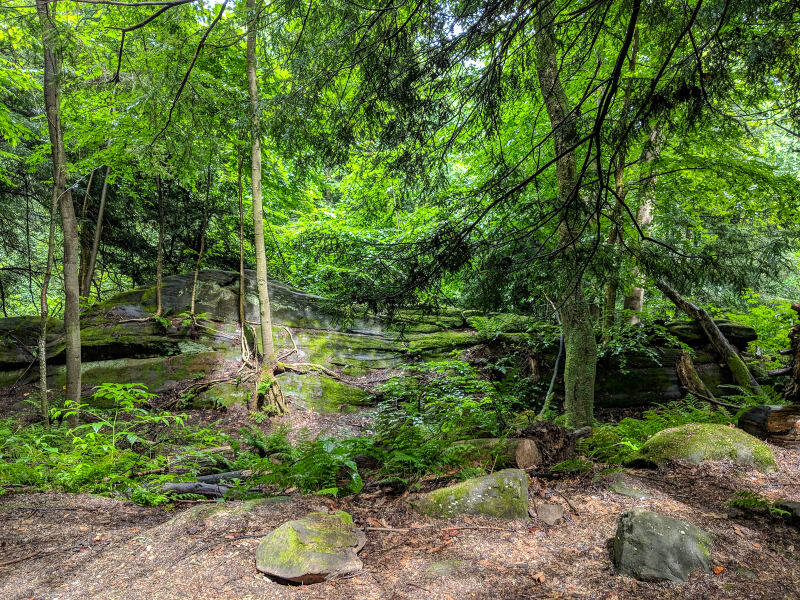 Cuyahoga Valley National Park is one of those parks most people don’t even know exists. I didn’t until we really started planning our trip. 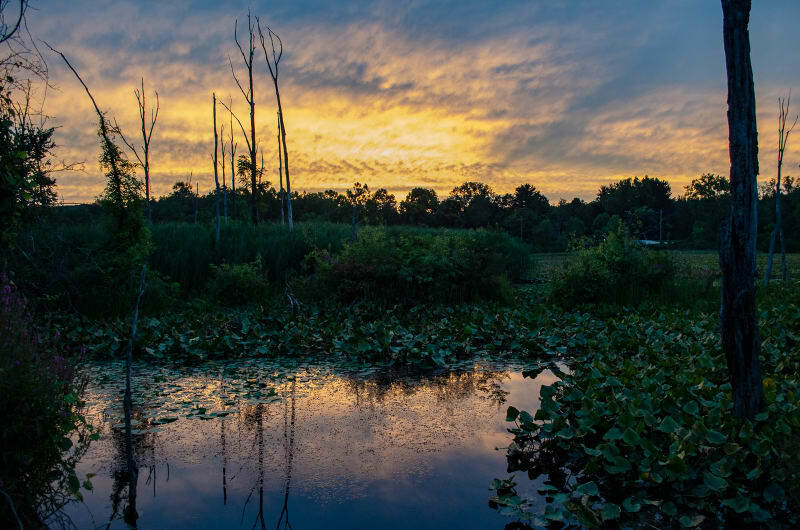 It’s located in the northeastern corner of Ohio and preserves the rural landscape along the Cuyahoga River between Cleveland and Akron. To be honest, I didn’t really have high hopes for Cuyahoga Valley before our arrival. I once heard it described as an example of the National Park System being used for political purposes rather than to preserve a truly wonderful natural landmark. I don’t know if there is any truth to that, but regardless, it didn’t seem like the park had quite as much to offer as some others, so we only planned to spend a few days there. It rained on our first day, but we decided to venture out anyway. Our first stop was the Boston Mill Visitor Center to get ourselves oriented. 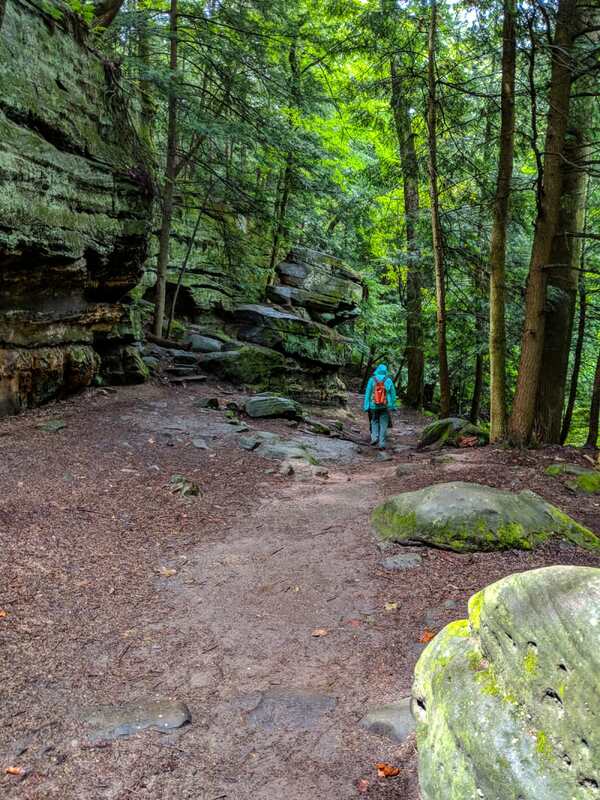 We learned about a ranger-led hike at the Ledges that afternoon, so we headed that direction next. It was still raining when we arrived, and we ended up being the only people on the hike. I’m sure the ranger was a little disappointed that they had to do the hike in the rain, but we had a great time getting a private tour through the area. 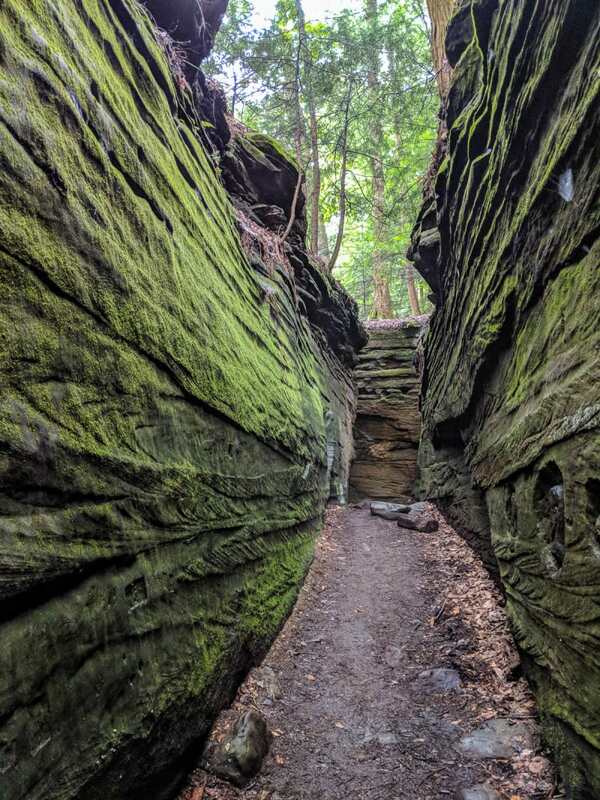 The Ledges are a rocky outcropping of moss-covered sandstone cliffs, and it’s one of the most scenic hikes in the park. The rain made it challenging, but it also made the colors of the trees, ferns, and moss really pop, and we had a beautiful hike. We went back the next day for another ranger-led hike - this time through Beaver Marsh. Beaver Marsh was an auto repair shop surrounded by a field of old cars when the National Park Service purchased it. The NPS planned to turn it into a parking lot, but while cleaning it up, some beavers dammed the nearby river, flooding the area. The park service tried clearing the dam and continuing, but the beavers dammed it again. At that point, they gave up on the plans for a parking lot and allowed it to become Beaver Marsh. 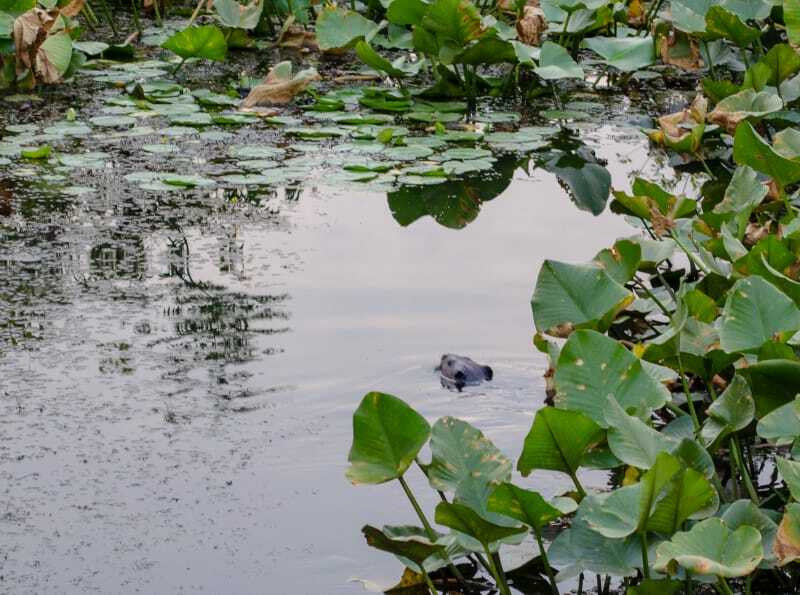 Despite the name, actually seeing Beavers is apparently pretty rare. 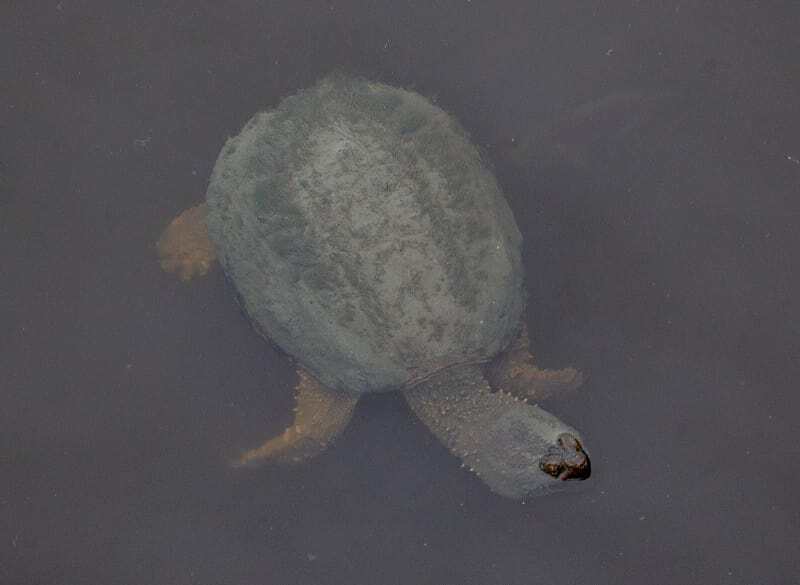 The ranger told us that they had never actually seen one while on a ranger-led tour. We still had a nice walk through the area, it was interesting to learn about the history, and we did see some muskrat, turtles, and a blue heron, but we were bummed about not seeing any beaver. Luckily, as the tour was ending, a photographer walked by and mentioned that he typically sees the beavers around 8:30 pm. It was only a half-hour wait, so we hung around and watched. Sure enough, right at 8:30 pm, two beavers came out! On our last day, we took the bikes out to ride on the Ohio and Erie Canal Towpath. 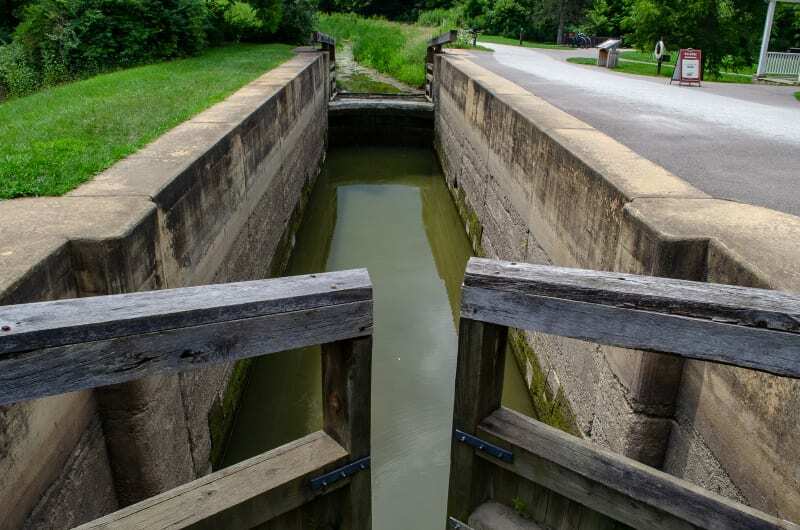 It’s a multi-use trail that runs along the Cuyahoga River and the old canal. 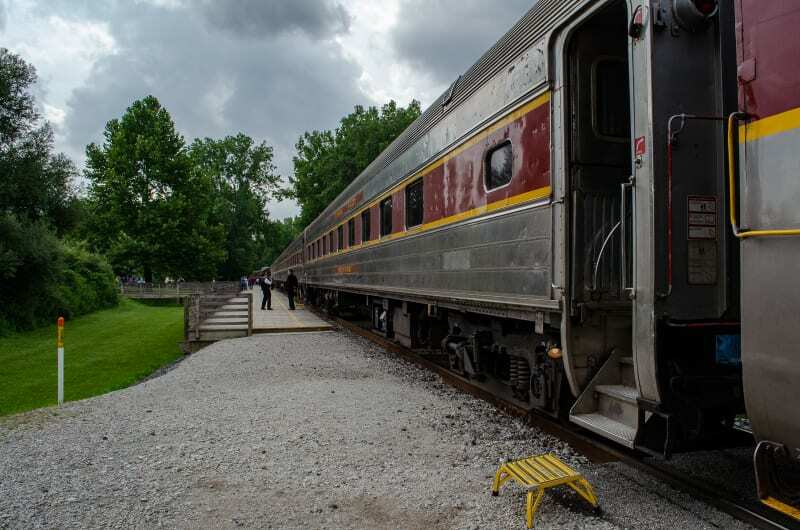 The Cuyahoga Valley Scenic Railroad also runs along the same course. They have a “Bike Aboard” program which, for $5, allows you to ride the train with your bike in one direction and then bike back to where you started. We hopped on, rode to the northern end of the line, and then began our ride back. It was a great ride along forest, marsh, and river landscapes, with many stops to see the old locks from the canal. I still have mixed feelings after visiting the park. We enjoyed our visit, and it really did feel like an oasis in the surrounding cities. I’m glad it has been preserved, and I think it’s a great resource for residents in the area. I think there is also a good argument to be made for designating more national park space on the eastern half of the continent, even if it isn’t as breathtaking as many of the western parks. On the other hand, it really felt more like Central Park in NYC than a National Park in its own right, and it’s hard to recommend it as a destination all by itself. 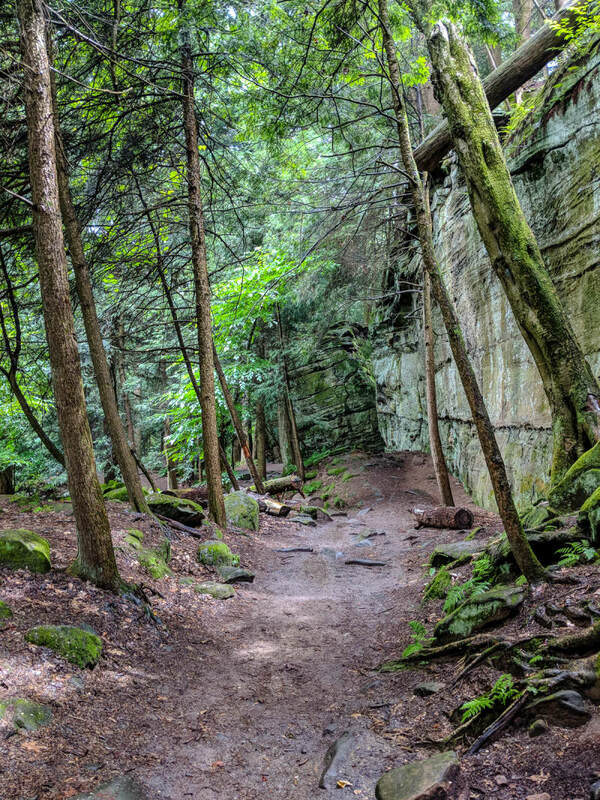 I’d definitely suggest a stop if you’re already in the area, but if you’re not, you’ll find better hiking, biking, and sightseeing spots plenty of other places. 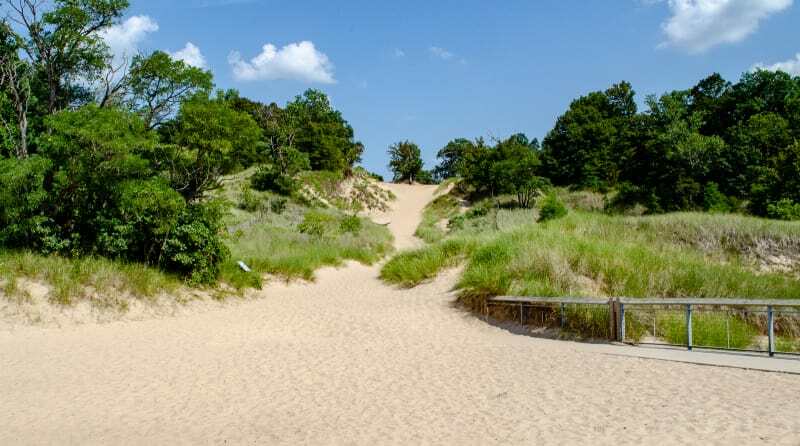 A few weeks back, I saw another full-time RVer post pictures from Indiana Dunes National Lakeshore in Indiana. The pictures were beautiful, and it looked like a great spot to enjoy the lake. We were headed to Michigan, though. 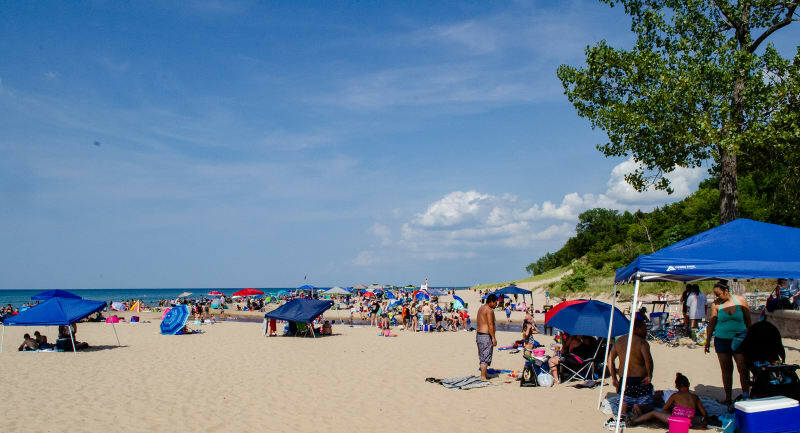 We didn’t book anything ahead of time in Michigan, and unsurprisingly, campgrounds along the water were pretty full when it’s less than a week away from a hot weekend in the summer. Most of the campgrounds where we wanted to be were already booked up. Oops. 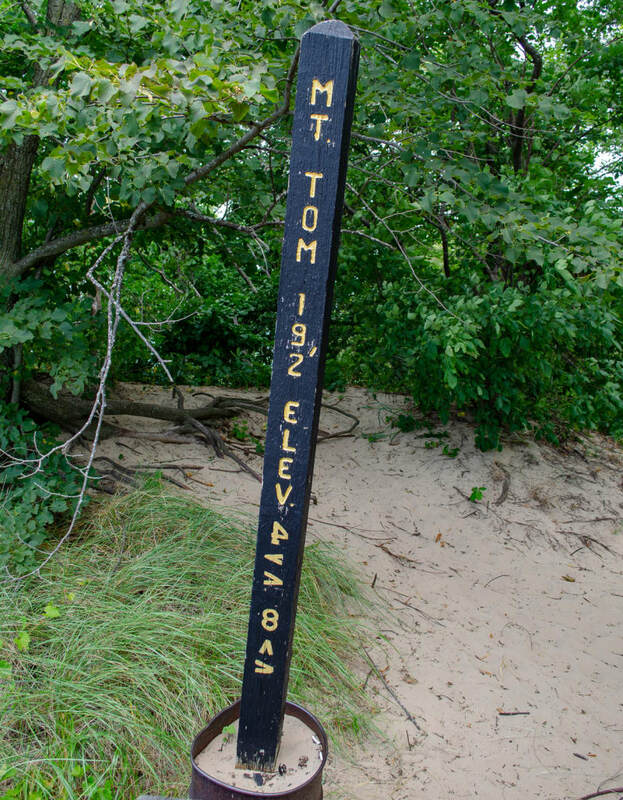 We luckily found a site available at PJ Hoffmaster State Park near Grand Haven; however, our current reservation was ending Saturday morning, and this wasn’t available until Sunday night. We needed to find something for Saturday night. 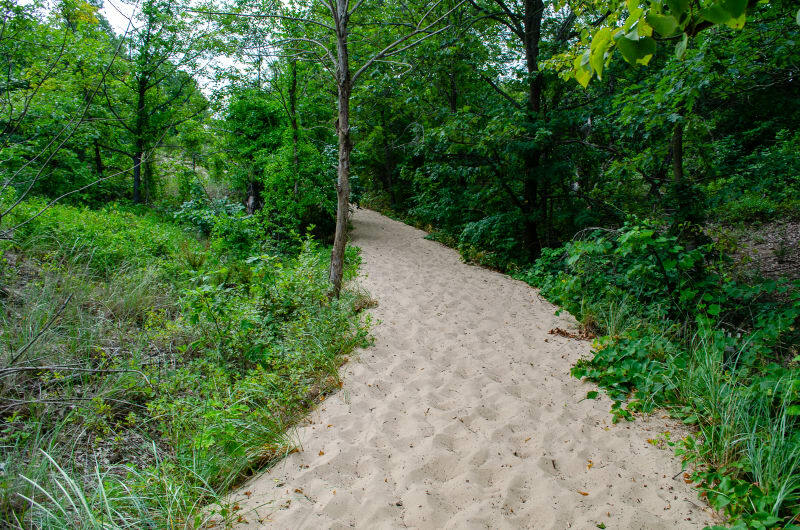 While browsing the map between Cuyahoga Valley and Hoffmaster State Park, I noticed Indiana Dunes and remembered the pictures I had seen. I checked, and there was one site left! I quickly booked it. 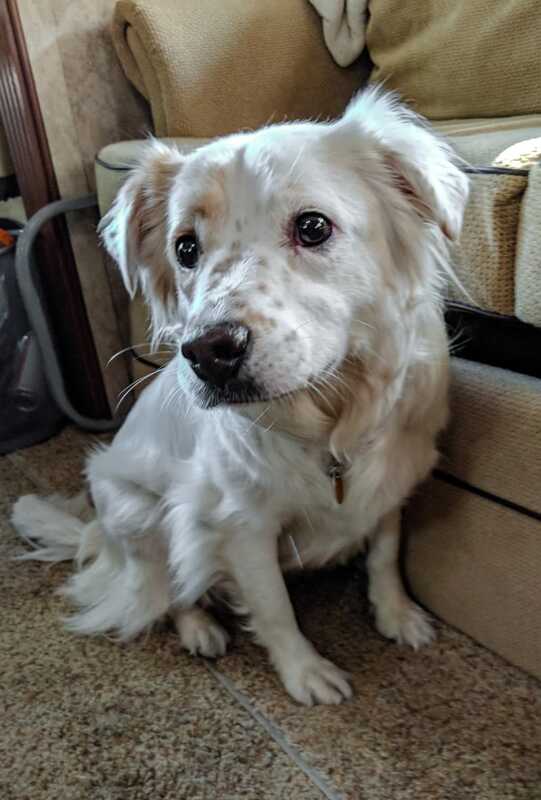 There was a 2 night minimum for the site, so we booked for Friday and Saturday, and it left us with the option of staying in Ohio as planned or leaving a day early to have more time at the lake. 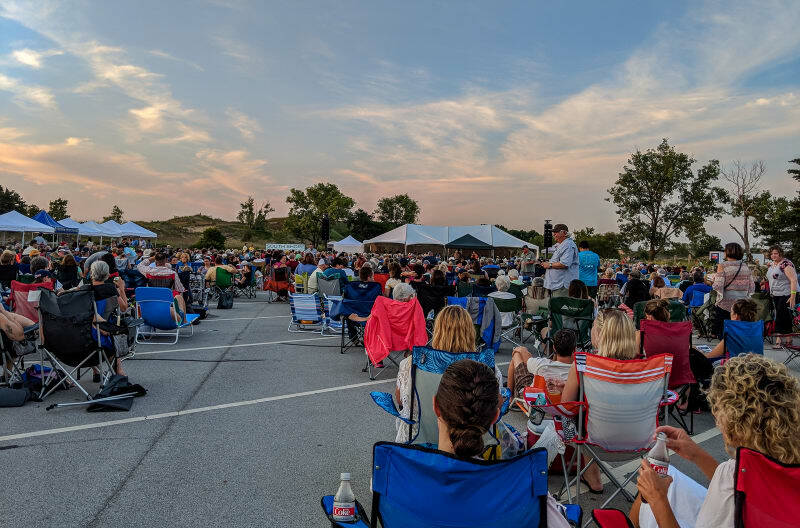 While researching the park a bit, I noticed that there was a free concert in the park on Friday night. At about the same time, my brother, Jesse, texted me to check on our travel plans. He would be driving from Pennsylvania to Colorado at the end of the week, and he wanted to try to meet up with us. 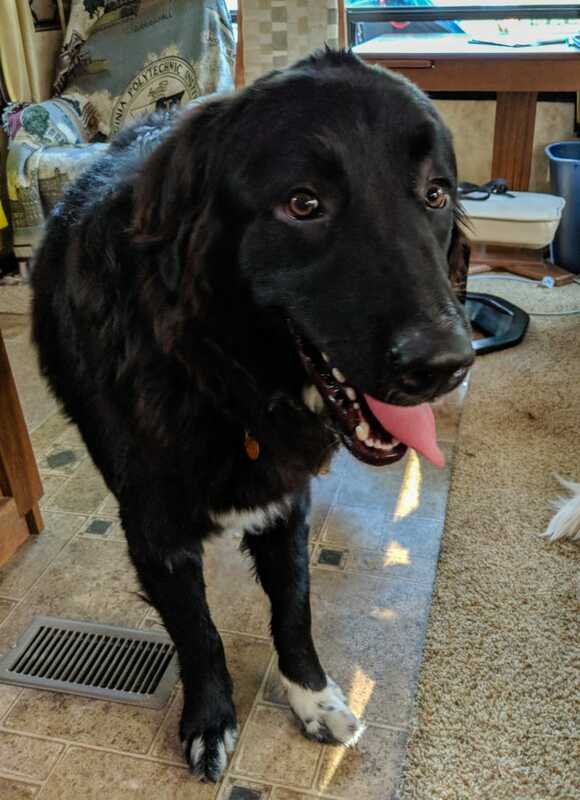 It turns out he’d be passing right by Indiana Dunes on Saturday morning, so that made the decision - we’d leave Ohio early and spend an extra day at Indiana Dunes. We wanted to get an early start on Friday, so we decided to flush our tanks and pack up a bit on Thursday night. I was outside emptying the tanks, and I felt a couple drops of rain. I wanted to wrap up as quickly as I could, so I yelled inside to Sushila to ask her to check the tank levels. She responded with, “no, I can’t do anything - we have no power!” I looked up, and the RV was completely dark. At that same moment, a downpour hit. I ran inside, soaking wet, and we stood in the dark trying to figure out what had happened. The situation didn’t really make sense. If the power at the pedestal went out, our inverter should seamlessly transfer the loads over to the battery, and we wouldn’t even notice. Also, all of our neighbors still had power. This was bad. I ran back into the rain to check the components in the electrical compartment, and I noticed the inverter read low battery. This didn’t really make sense since our battery was at 100% and we hadn’t really been using it. I checked the fuse, and yep, it was blown. Even with the fuse blown, though, the inverter should have been powering the rest of the RV instead. It appeared that something major went wrong. We regrouped inside and started troubleshooting. We know we were using a lot of power at the time – the dryer was running, Sushila was vacuuming, and it’s possible the AC tried to start. Even all of that is less than the 50 amps we had available; however, if the storm caused a flicker in the power, our inverter would instantly transfer all of the load to the battery. That’s enough to blow our 150 amp battery fuse. That isn’t really bad; it’s what the system is designed to do. It wouldn’t hurt the battery at all, and replacing the fuse would fix it. What didn’t make any sense is that the inverter should be powering the RV from shore power. We knew the power was fine at the pedestal (at least now) because the surge protector was on and reading no errors. We tried rebooting the whole system from scratch, but it didn’t help. We decided to give up for the night since we didn’t really need power to sleep, and we’d deal with it in the morning. While in bed, I pulled up the manual for the inverter to look for troubleshooting ideas. As I browsed, I hit the section titled, “Remote Controlled Operation”, and it immediately came back to me. Our inverter is controlled remotely by a display panel in the RV. When connected, the inverter won’t start until the control panel tells it to. With the battery disconnected, the control panel had no power, so the inverter wouldn’t start. It’s an easy fix that we had done many times when we were building the system. Simply disconnect the control panel, start the inverter, and then plug it back in. We did that, and everything powered back up. Whew. The next morning, I began the search for a new fuse. I called a few hardware stores, but none of them had what we needed. There were a few electrical supply places in town, too; however, they wouldn’t sell directly to the public. We could move without the battery, so I started searching online hoping to order one and have it delivered to our next stop. While browsing, I noticed that a lot of the places that sold the fuses we needed were car audio shops. 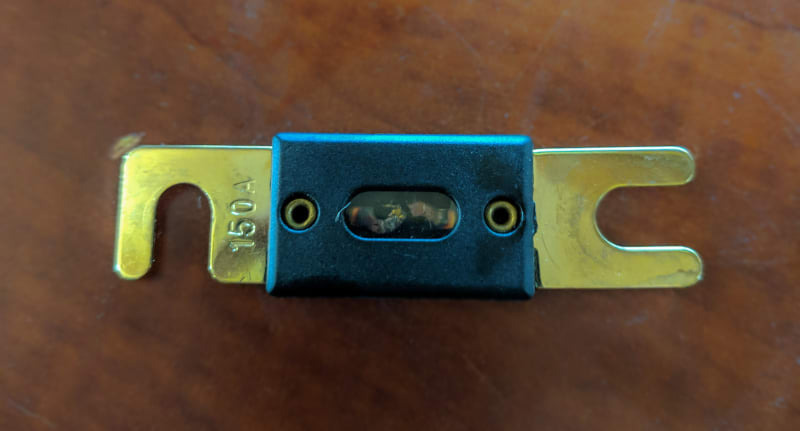 Apparently the same type of fuse is used in high-end car sound systems. I called a car audio shop a few minutes away, and they had what we needed. I picked up the fuse, installed it, and everything was back to normal. Despite the slow start in the morning, we still managed to arrive at Indiana Dunes in time for the concert. We were a little tired from the drive, but there were supposed to be food trucks at the concert, so we decided to venture out for music and food. Unfortunately, so did everyone else. We hoped to have time to explore the dunes before the show, but the main parking lot was full, so we ended up parking almost a mile away and walking in. Once we got in, we discovered very long lines for the food trucks. By the time we had our dinner, the show was starting. No dunes exploration for us. The show was a lot of fun, though. It was a performance by the Northwest Indiana Symphony Orchestra. They played a good selection of fun, recognizable music, and the conductor was entertaining. Jesse and the dogs arrived the next morning. It ended up being a ridiculously hot day, so we spent most of our time relaxing and catching up in the air-conditioned RV. We took a quick walk out to see the beach and the dunes, and then Jesse was back on the road to continue his trip. It was a hot day, and the beach was packed. The next morning, when the temperature was a bit cooler, Sushila and I went back out to explore the beach and dunes a bit more. The park had quite a few hiking trails, and one went over the dunes and back to the campground, so we decided to give it a shot. The dune, Mt. Tom, was only about 200’ tall, and it looked like a more direct route back to the RV. It turns out, climbing 200’ up a sand dune is a lot harder than 200’ up a dirt trail. We struggled, but we eventually made it to the top and back down to the campground. View from the top of Mt Tom. At one time, the water level was this high. We packed up and headed on to our next stop. We spend the next two weeks exploring Michigan. 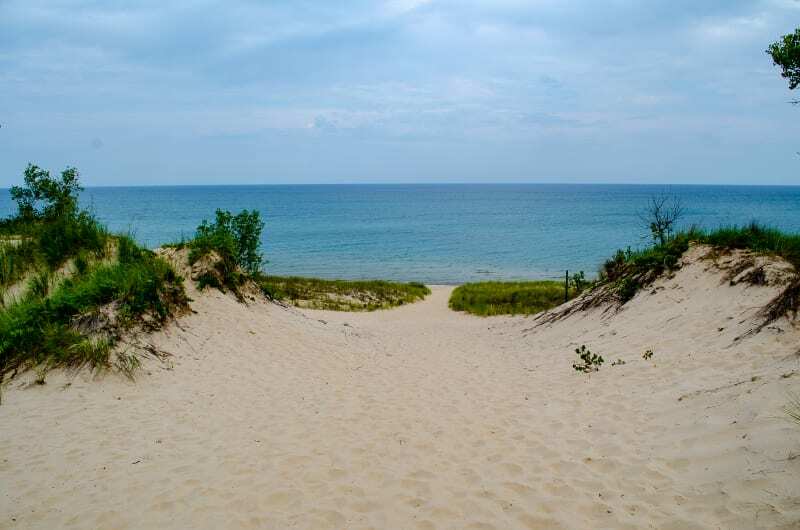 We have a few more days along Lake Michigan at Hoffmaster State Park, and then we head to the Upper Peninsula.